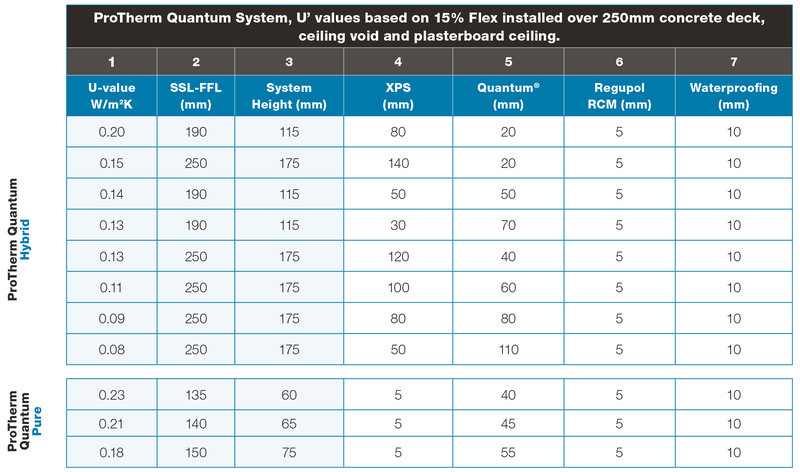 In the U-Value Calculation Chart below we have provided some example build-ups based on target u values (column 7), and, in column 1, shown the resulting height between Surface Slab Level (SSL) and Finished Floor Level (FFL). The SSL-FFL includes for the 75mm drainage zone required by NHBC Chapter 7.1 when using an inverted roof with paving. For Ballasted Roofs simply add the ballast depth to the System Depth (column 6) to get overall roof depth. Similarly, for Green/Biodiverse Roofs add the overall depth of the green roof elements to the System Depth. For project specific u value and SSL-FFL calculations please e-mail your project details, together with your target u value and SSL-FFL, to techenquires@radmat.com or call 01858 410372.